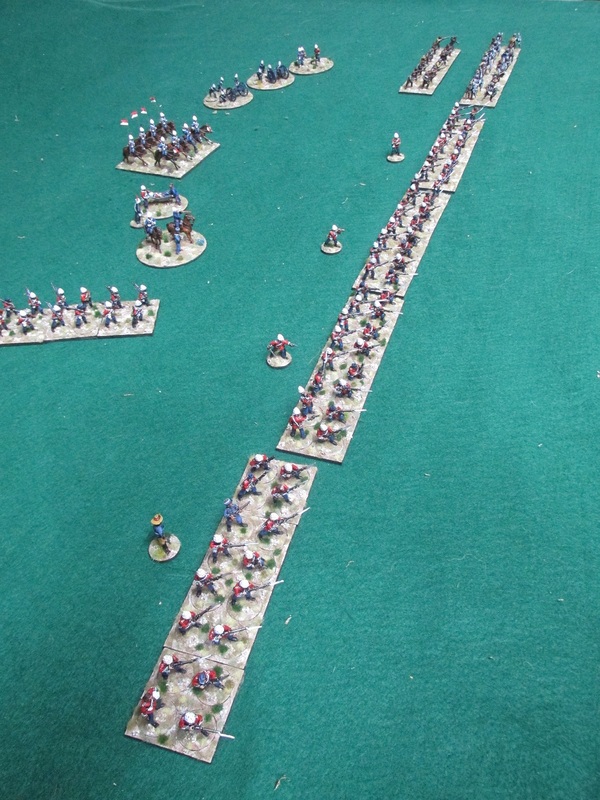 And here are the Imperial forces mustered so far to fight the Zulu. 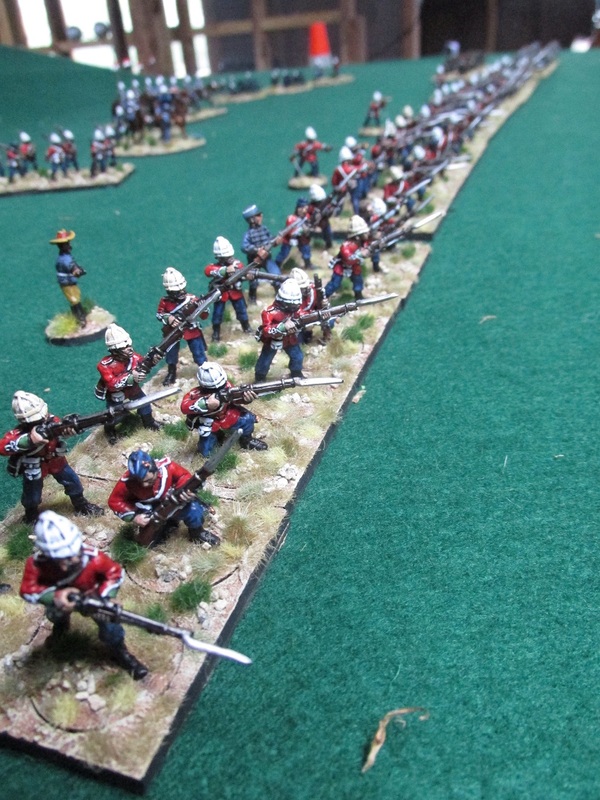 British regulars backed by European and native contingents. 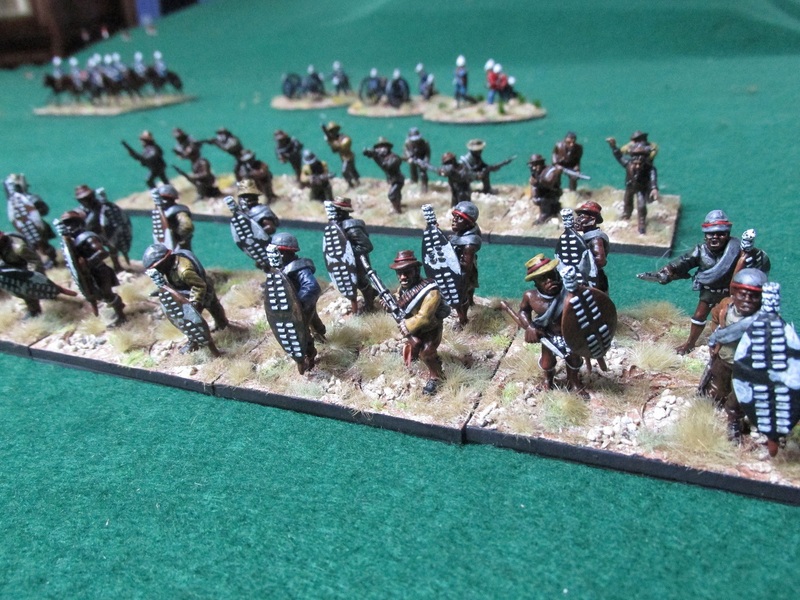 I plan to add to thus force using the fantastic Empress Miniatures range to flesh out the various mounted infantry and cavalry units and more natal native troops. 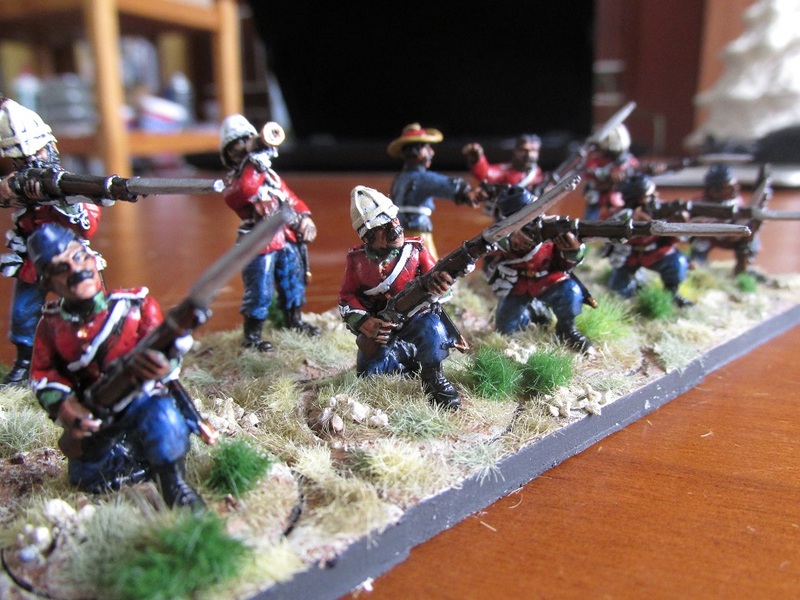 So far I have painted the five companies of the 1/24th present at Isandlwana and have enough unpainted lead to finish the remaining British regulars (might even do the band if I can find the figures). 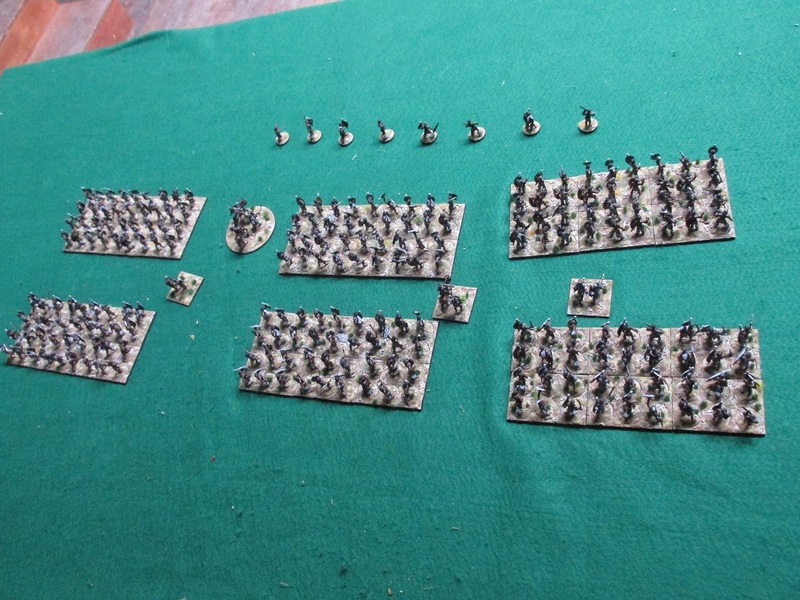 Of course, I also plan to do the naval contingent, rifles, some regular cavalry and lots of supply wagons – time to order more pencil sharpener wagons I think. Redoubt do British drivers. 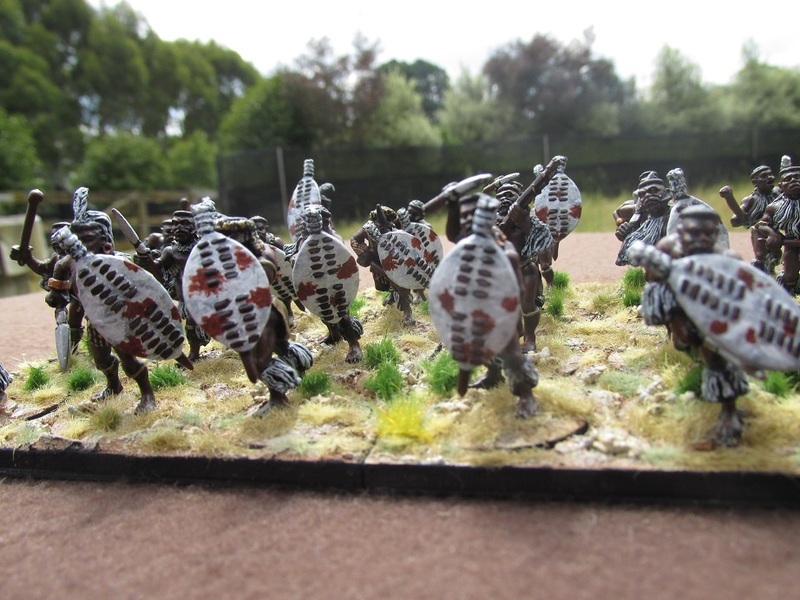 Anyone know a good source of plastic 28mm oxen? 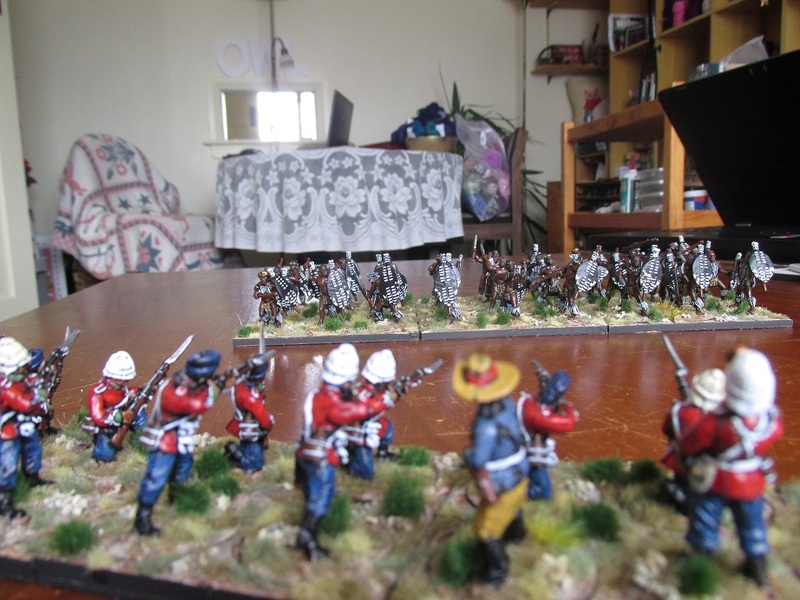 Dismounted Boer Volunteers fight the old foe. 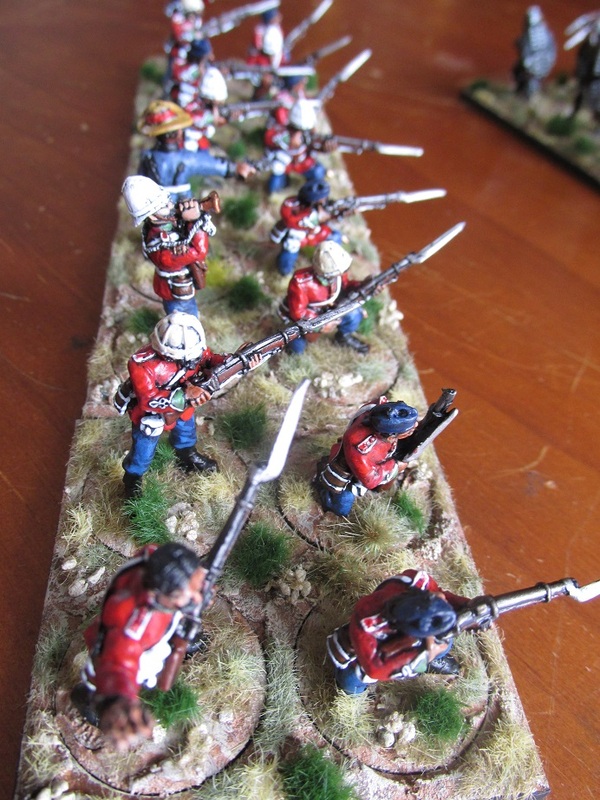 Love these Black Tree Natal Native Contingent infantry – just wish they did a few poses with rifles. 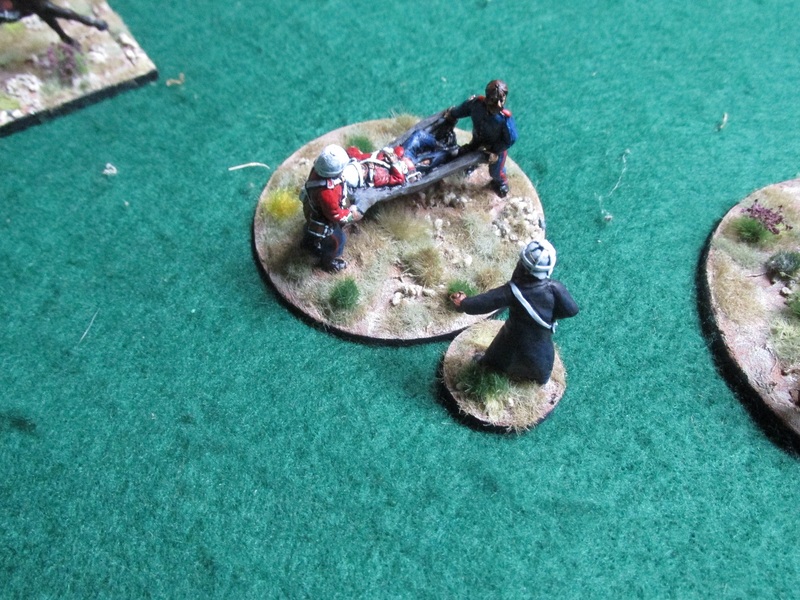 I guess it will be Empress Miniatures to the rescue here. Do you want fries with that, Sir? 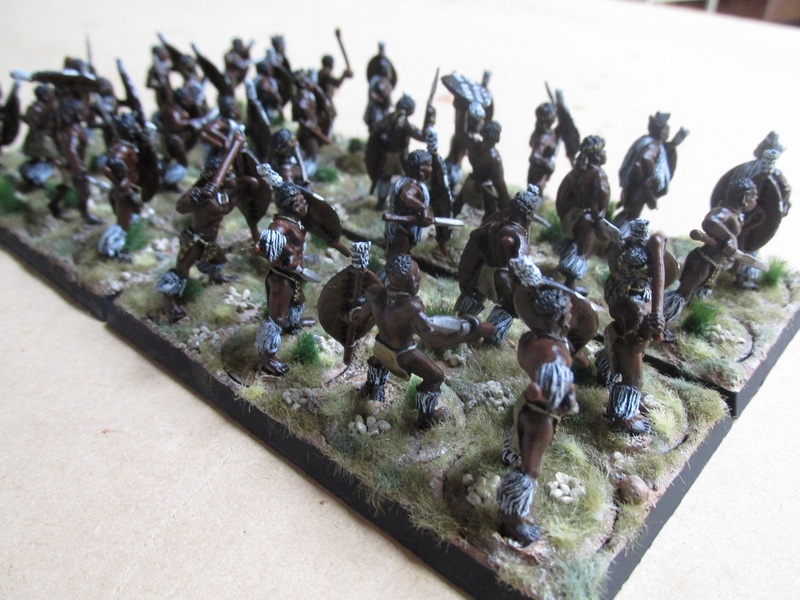 Redoubt and Black Tree figures. I have not done anything on this project for a while. 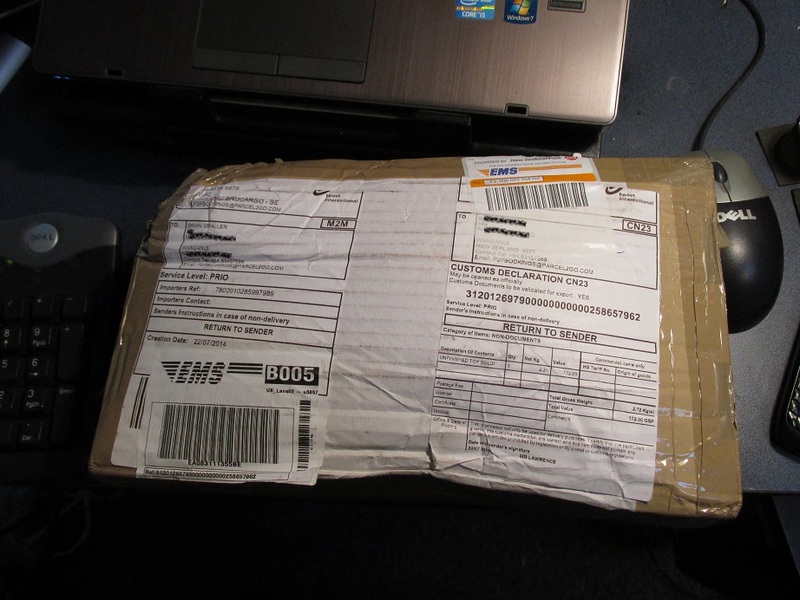 Got side-tracked by other things and real life. 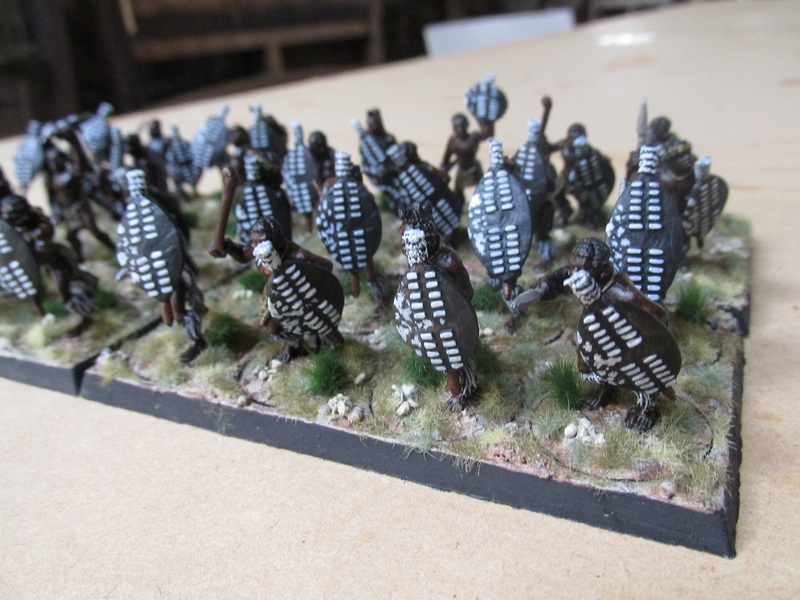 I have made all my Zulu regiments 36 figures so far. 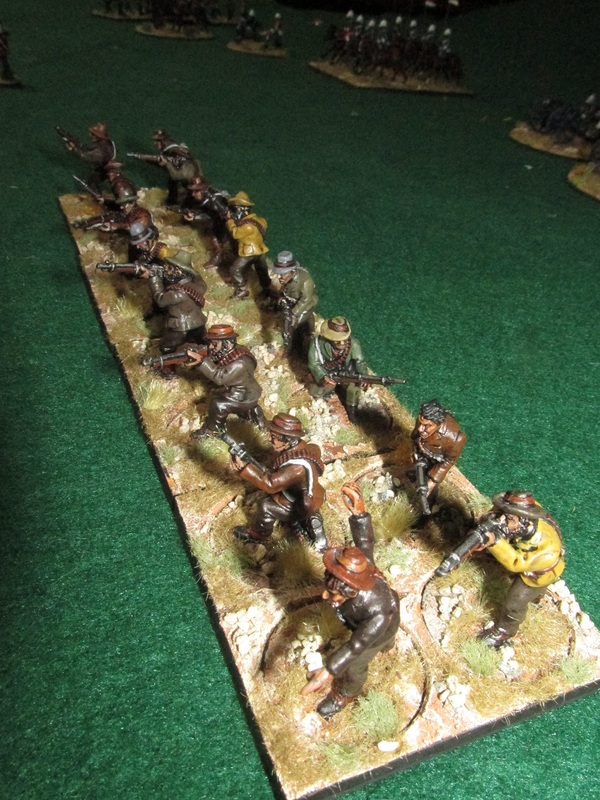 All are individually based on 25mm rounds that slot into custom made six slot sabot bases. 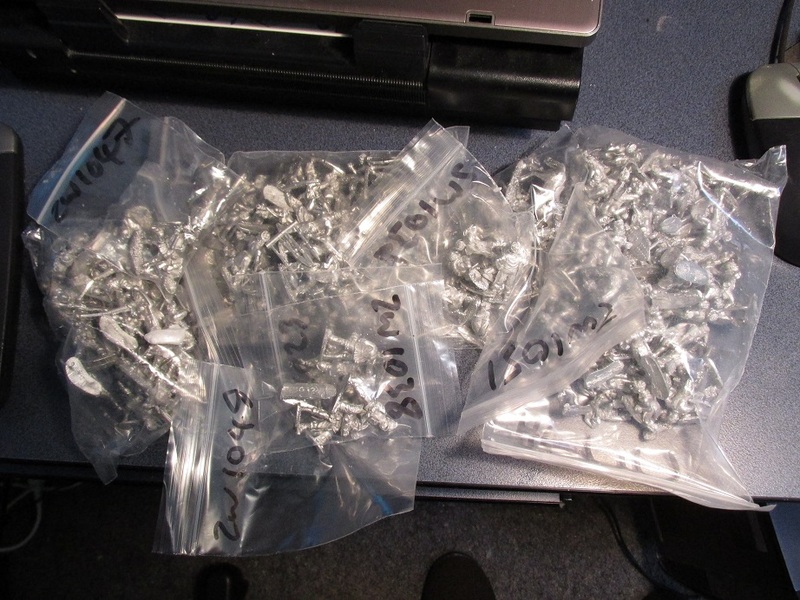 Sitting in boxes are about the same number of miniatures in unpainted lead. Almost all the models are Black Tree Designs. 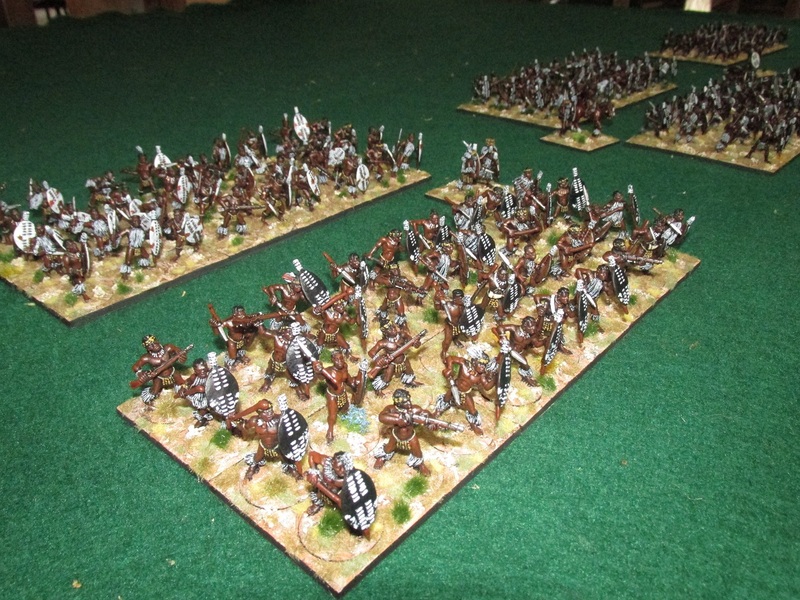 Their regular sales make them appealing for the budget conscious wargamer. 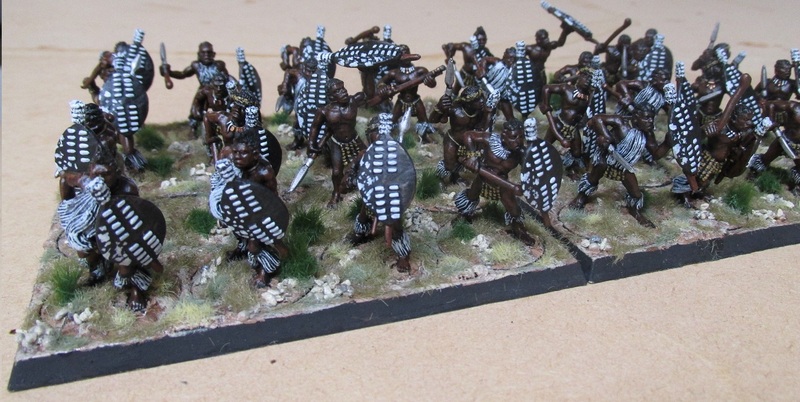 I brought some plastic Warlord Games Zulus and British infantry during one of their sprue sales but to be honest, once I got them I was just not happy with them. 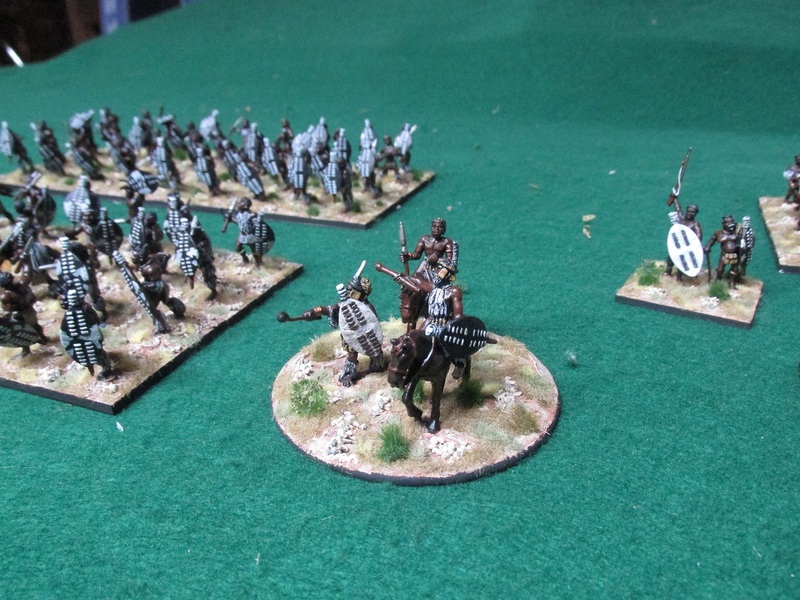 Great miniatures but lacking the heft that I like. 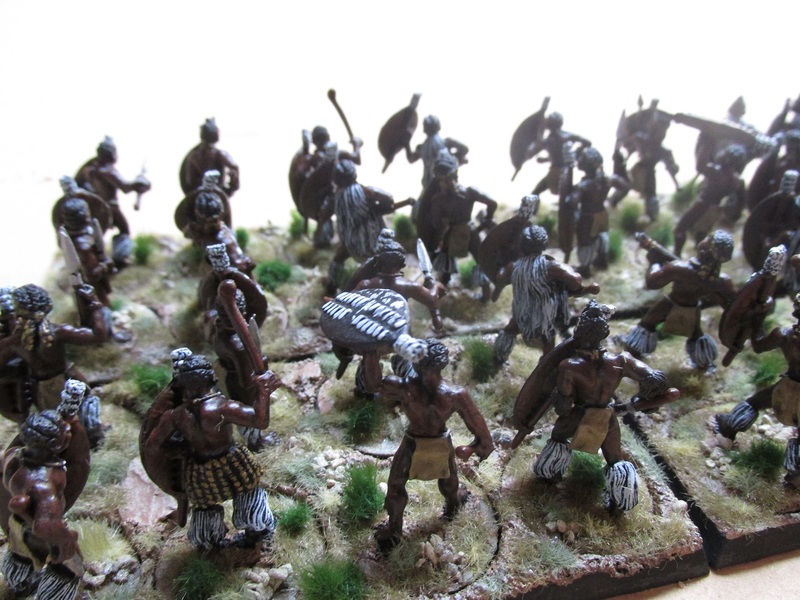 There are a few Redoubt Miniatures in the Impi so far – mostly command figures. 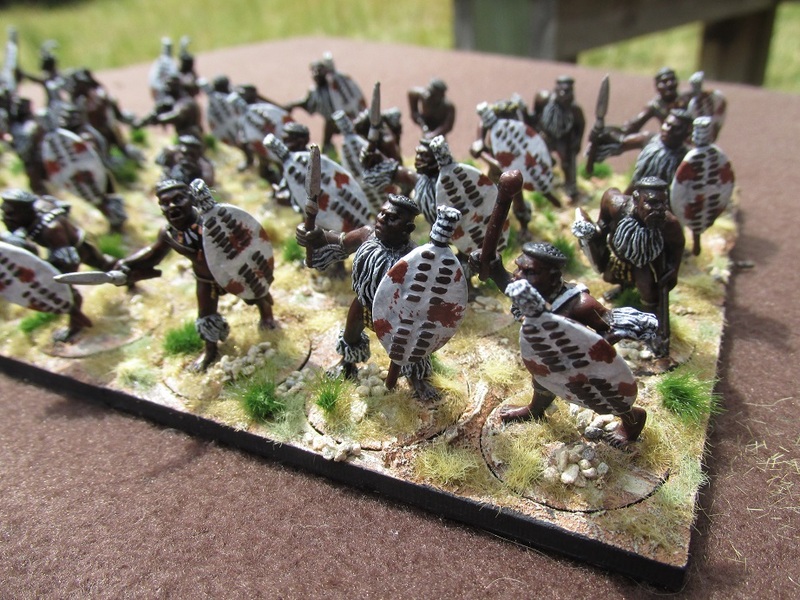 My intention is to make all the regiments that fought at Isandlwana. 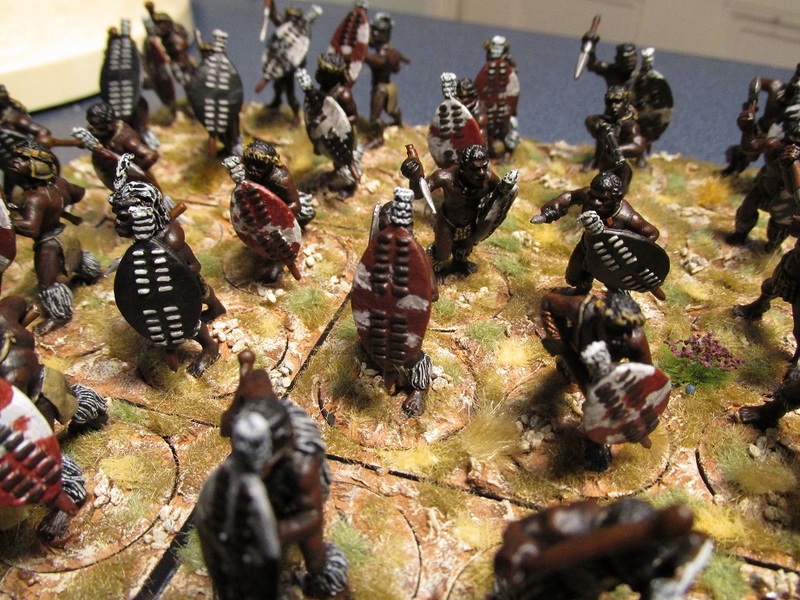 I certainly think that Zulus look just fantastic on the table top in numbers. 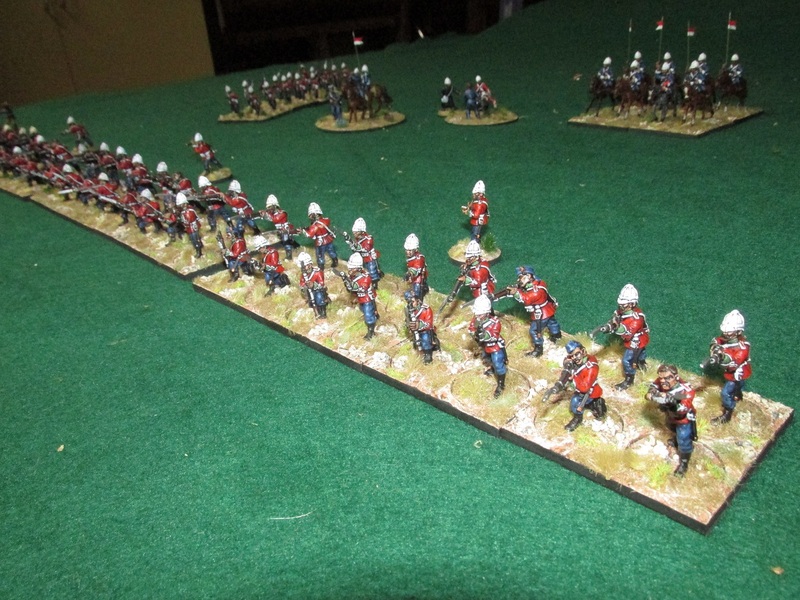 F Coy, 1/24th Foot was commanded by Capt Mostyn and was positioned approximately in the centre of the British Line and engaged units of the Zulu Chest before pulling back to the camp and being overrun. 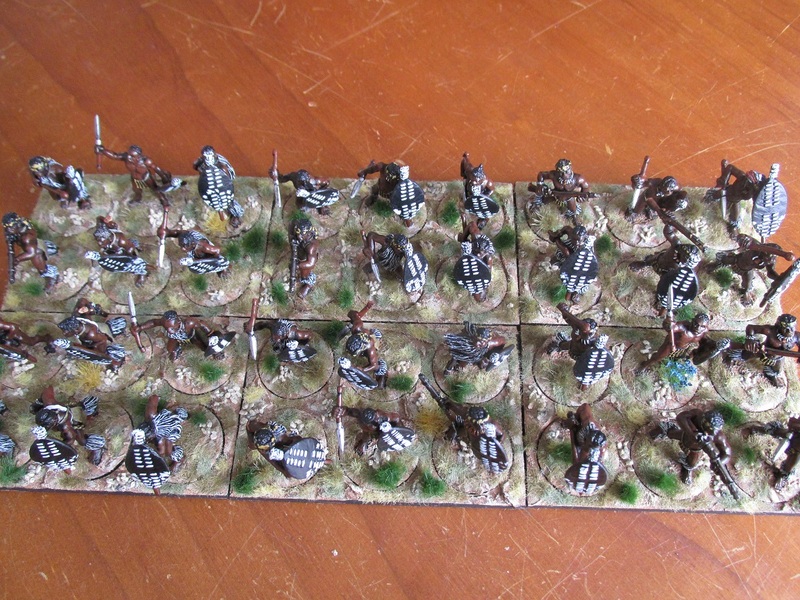 This is the last unit that I will have painted this year. 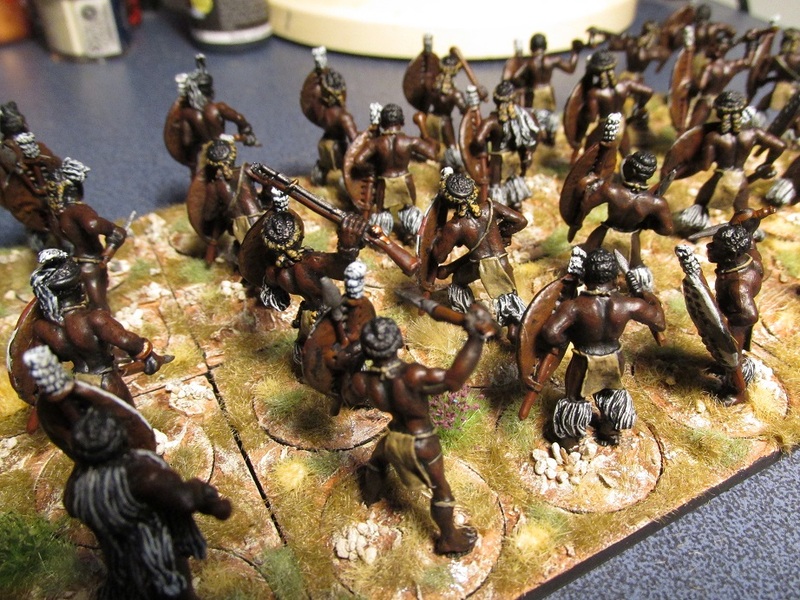 I had already given them an undercoat but got around to painting them yesterday. 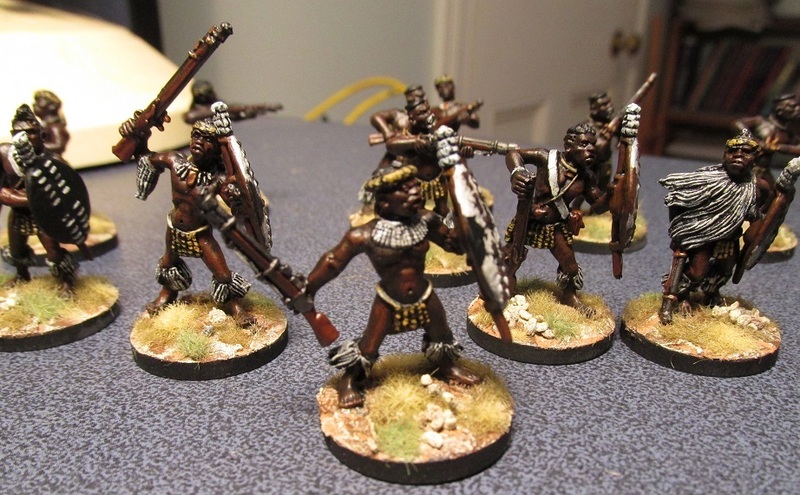 Today I got them varnished and finished off the bases. 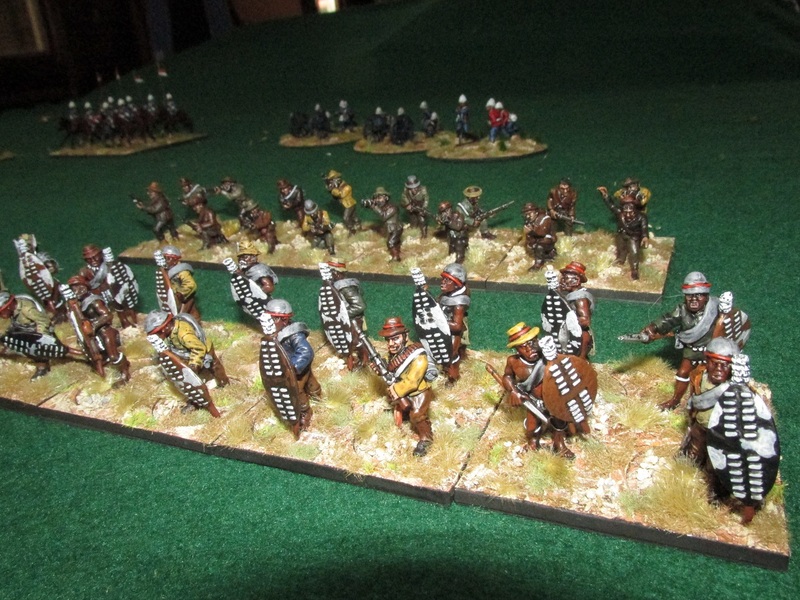 I already had the two officers painted so there were only fourteen miniatures to complete the unit. 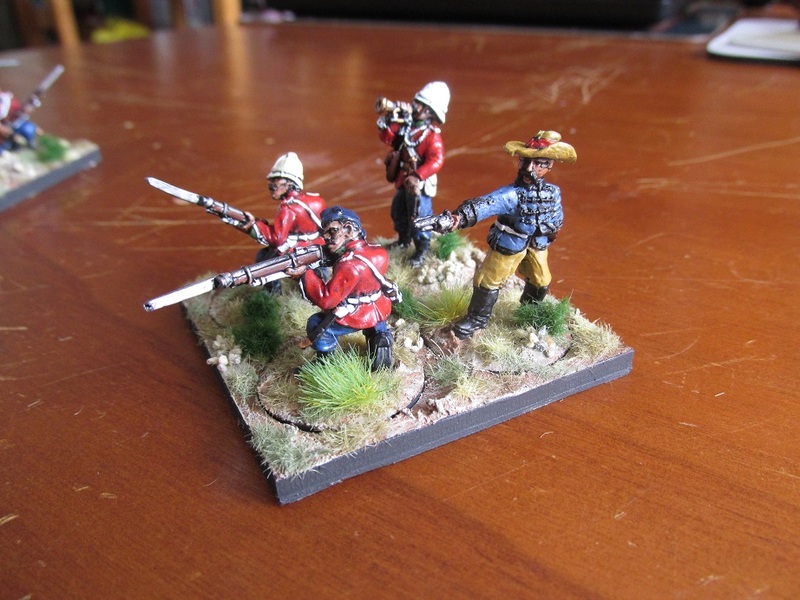 Figures are Black Tree Designs and one solitary Redoubt Miniature officer figure. 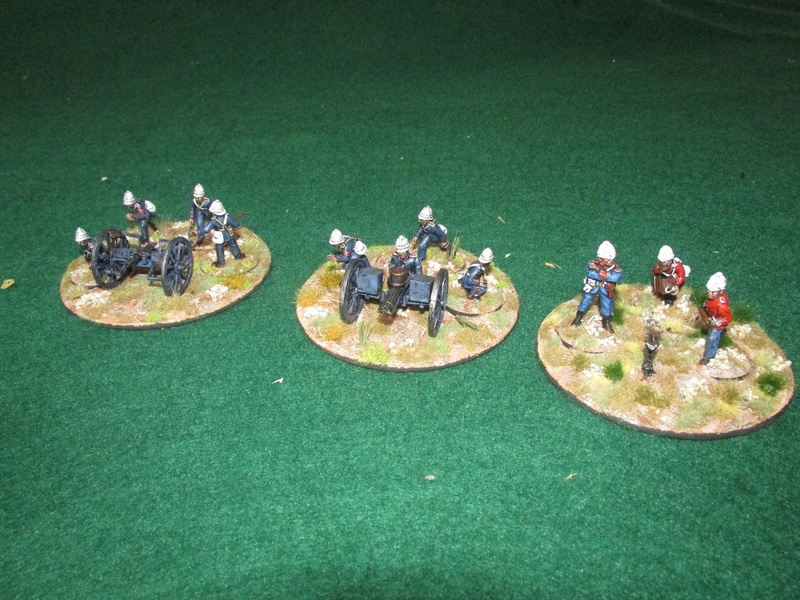 I now have five companies of the 24th Foot (1st Batn) completed. 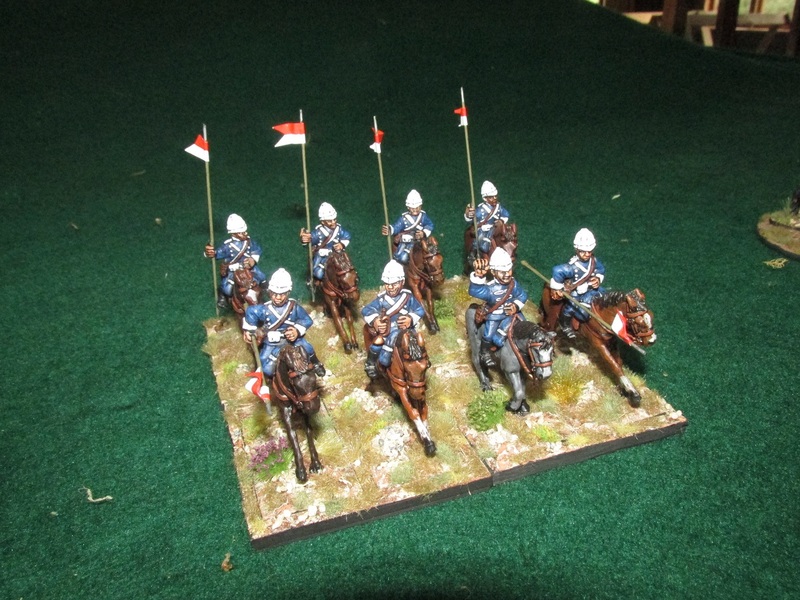 Need to do another two for the 24th Foot 2nd Batn and then move on to the Natal Native Horse, Colonial Mounted troops, some Imperial Mounted infantry and several more companies of the Natal Native Contingent. 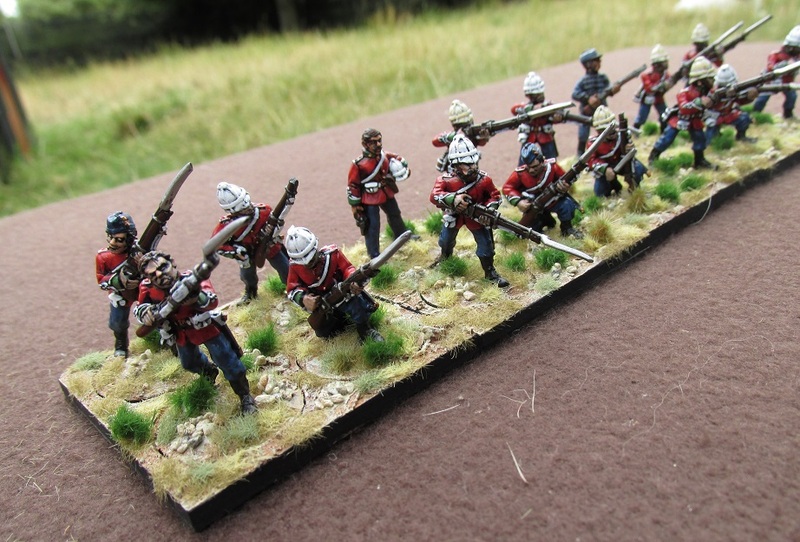 The IsAngqu “White Tails” or “Orange River” Regiment was formed in 1852 and at the time of the Battle of Islandlwana in 1879 it’s members were married men in their mid-40s (44-47). 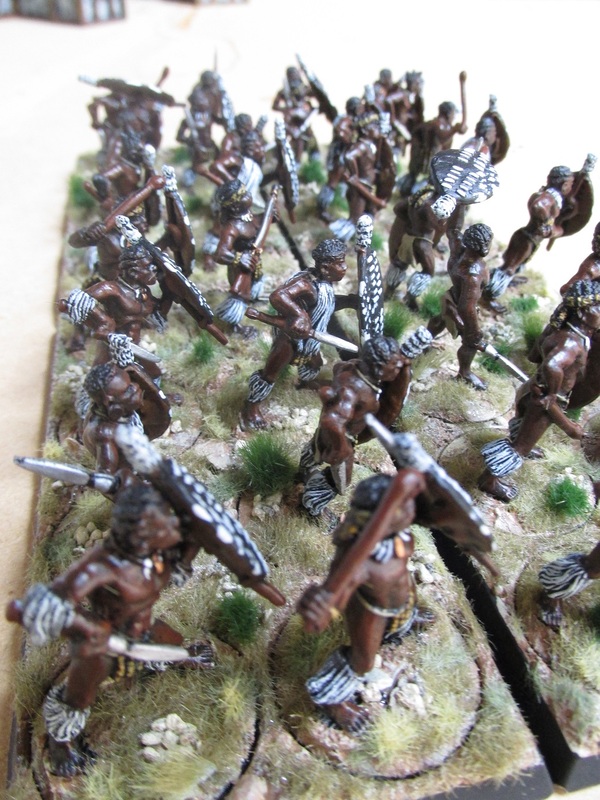 In 1879 it was part of the uNodwengu Corps, brigaded alongside the uDududu and iMbube Regiments. 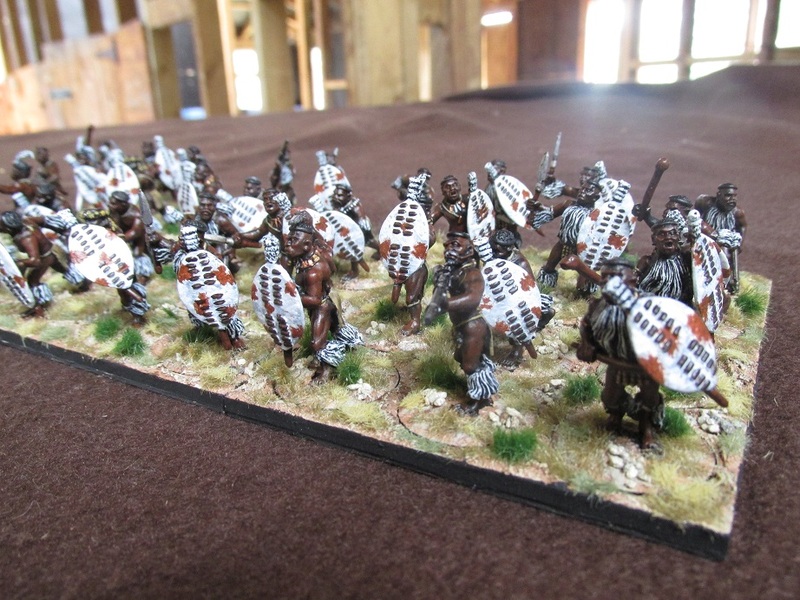 However, at Isandlwana, IsAngqu formed part of the Chest of the Zulu formation and the other two regiments of the uNodwengu Corps were deployed in the Right Horn. IsAngqu was also present at several other major engagements of the war, notably Kambala (29th March 1879), Ulundi (4th July 1879). 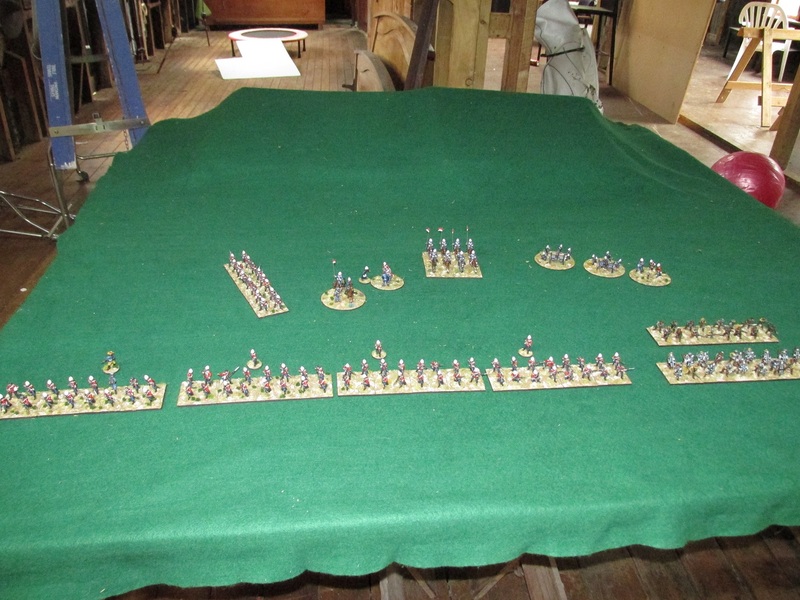 H Company of the 1st battalion, 24th Foot was commanded by Capt. George Wardell. 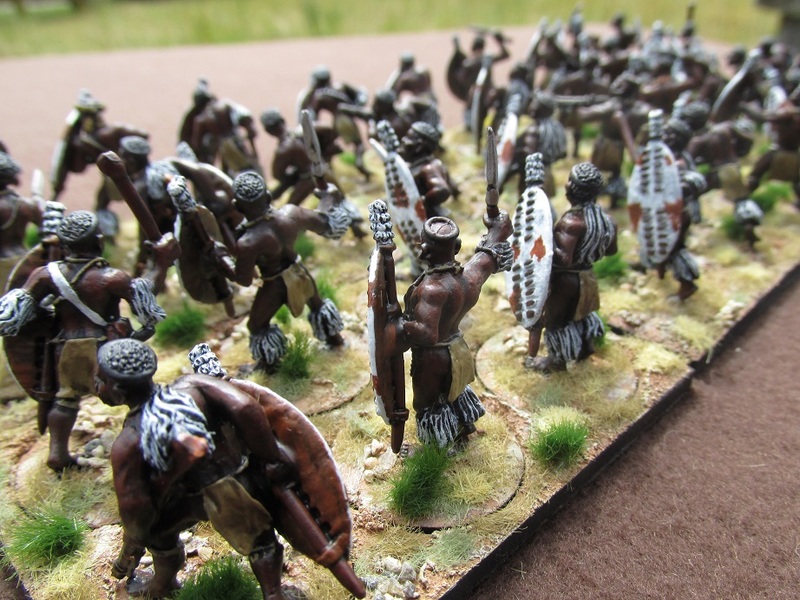 At Isandlwana it was initially stationed on the right flank and engaged the Zulu Chest formations. 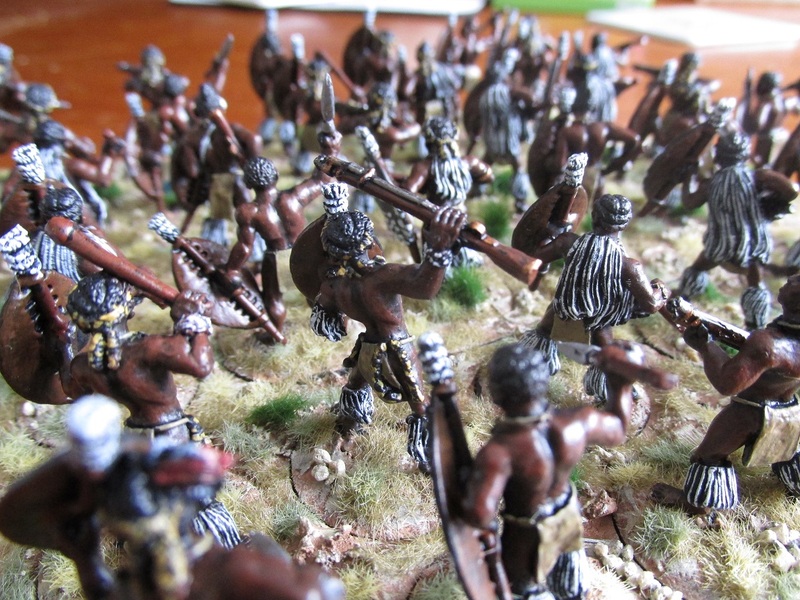 As the battle progressed it was flanked by the Zulu Left Horn regiments and was destroyed as it fell back to the camp. 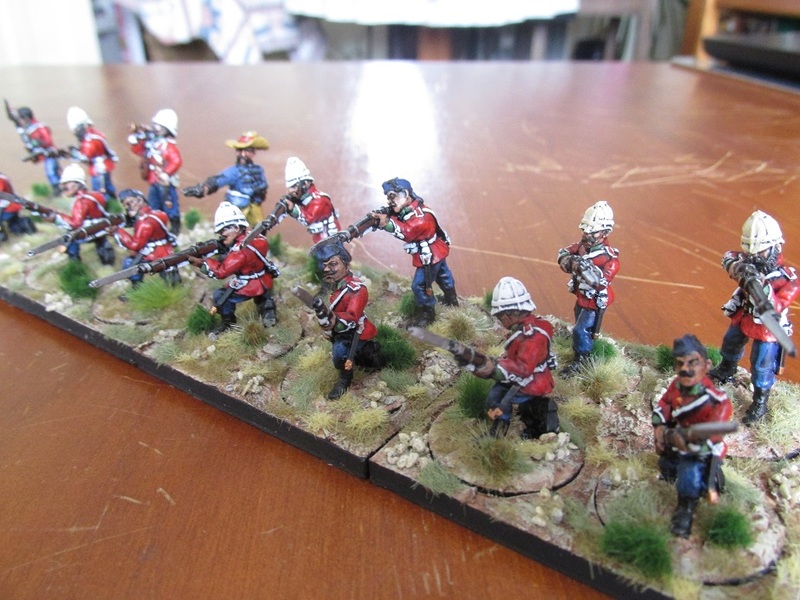 Figures are all Black Tree except for two Redoubt Miniatures – the bugler and Col. Durnford who is standing in for Capt Wardell until such time as I get home and put the correct officer in his place. 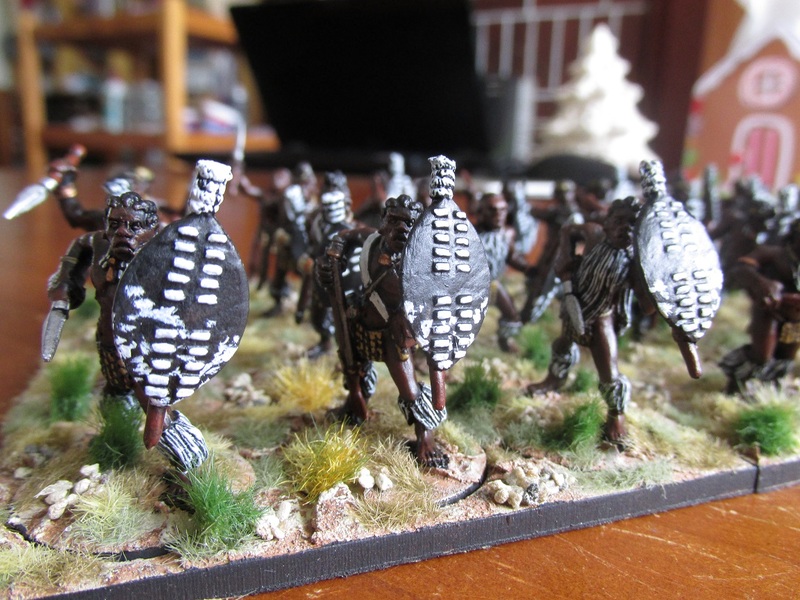 I actually finished these guys last week but have not got around to posting them as yet. 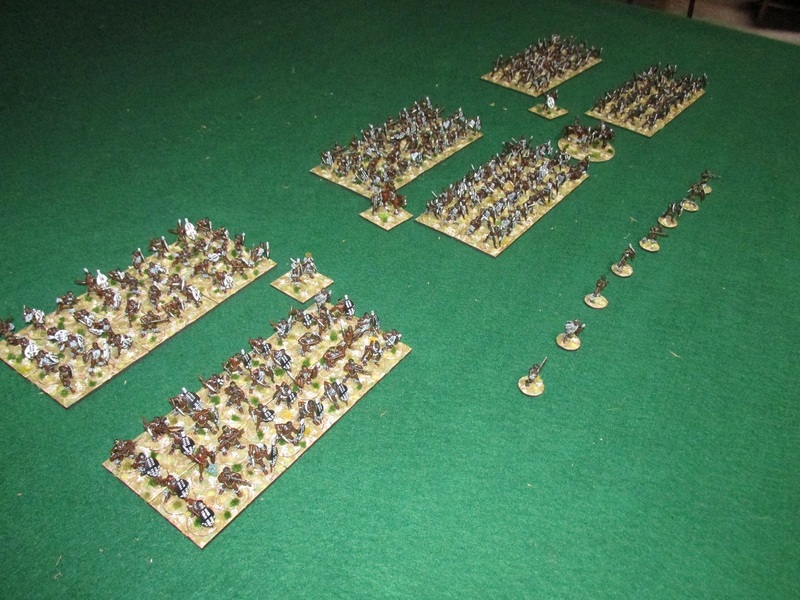 While the painting bug is biting again the blogging one isn’t quite there yet. 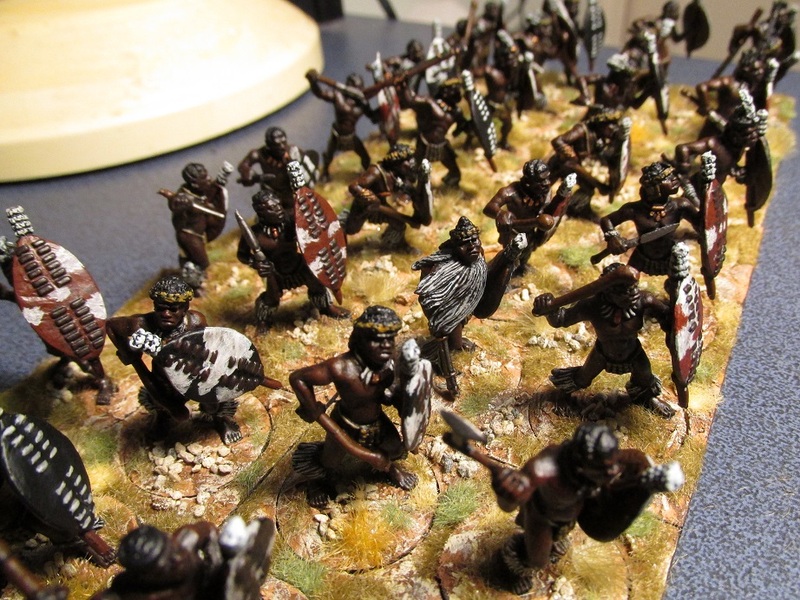 These are the uDududu Regiment. Formed sometime between 1857 and 1859 it comprised unmarried men in the 40-42 year old range. 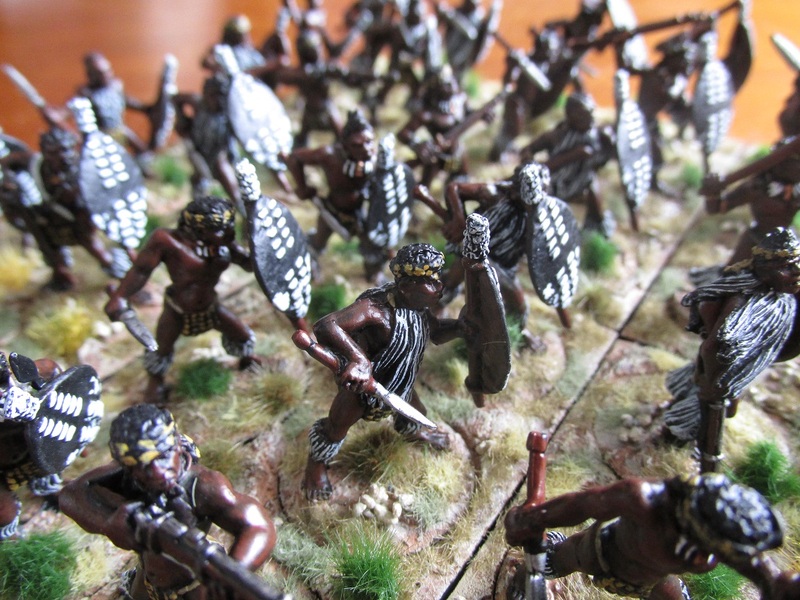 UDududu is a place name from a location on the coast of Zululand. 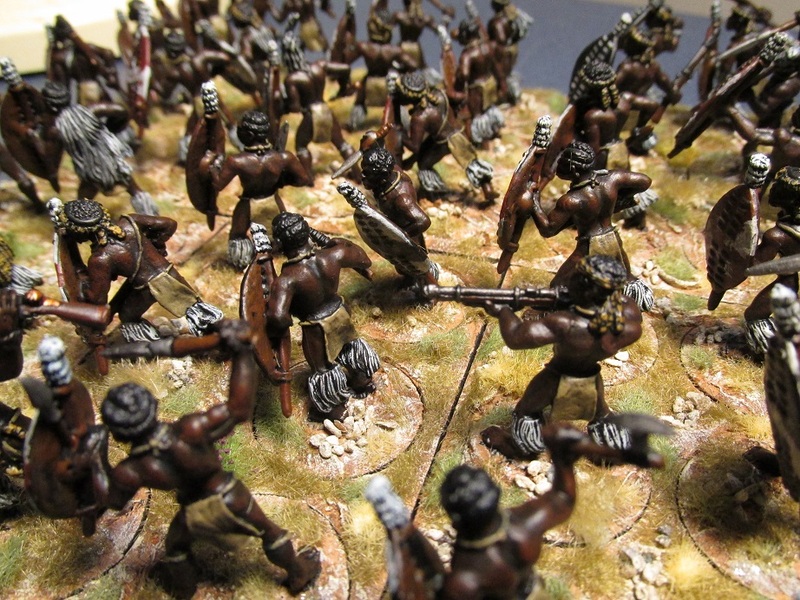 UDududu fought in most of the major engagements of the 1879 war. 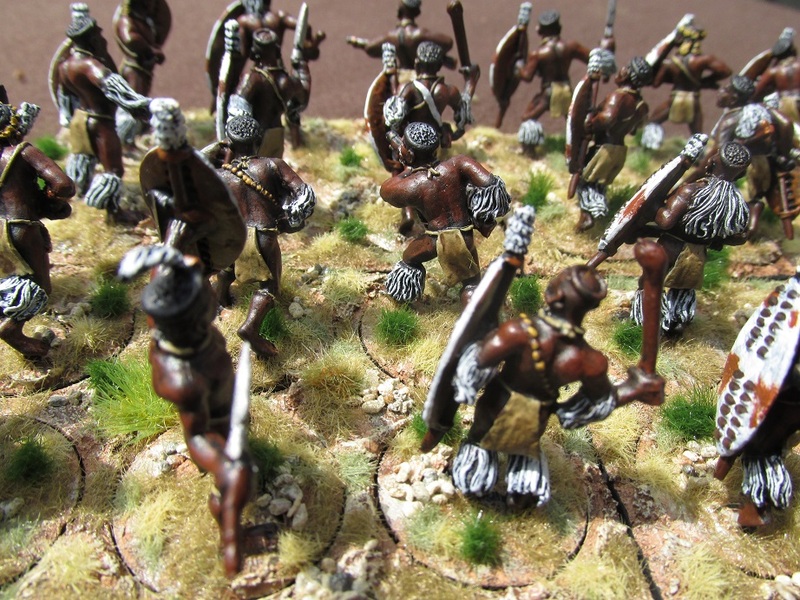 At Isandlwana they were part of the Right Horn of the Zulu formation that swung around Isandlwana Mountain and attacked the British camp from the rear. 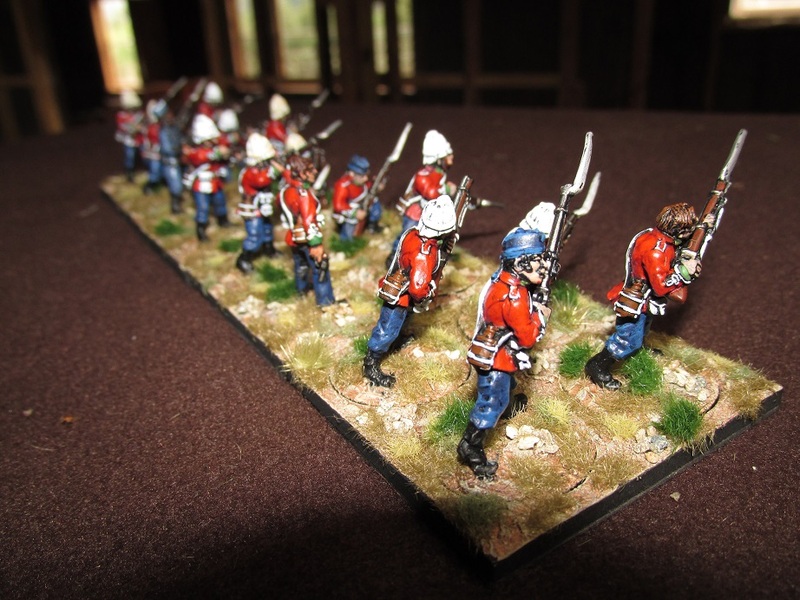 This is a 36 figure regiment. All models are Black Tree Designs. 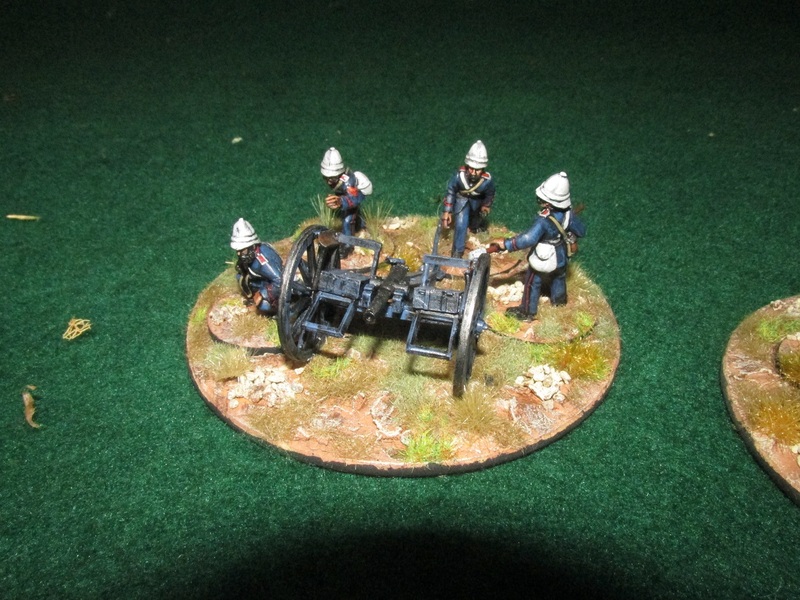 Finally finished another unit. It took a while but done. 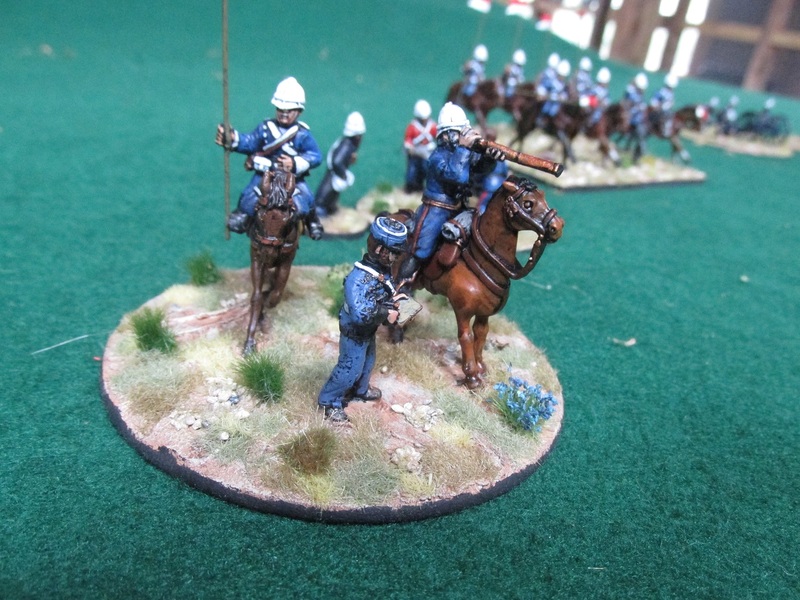 The umCijo were an unmarried regiment formed in 1867-68. 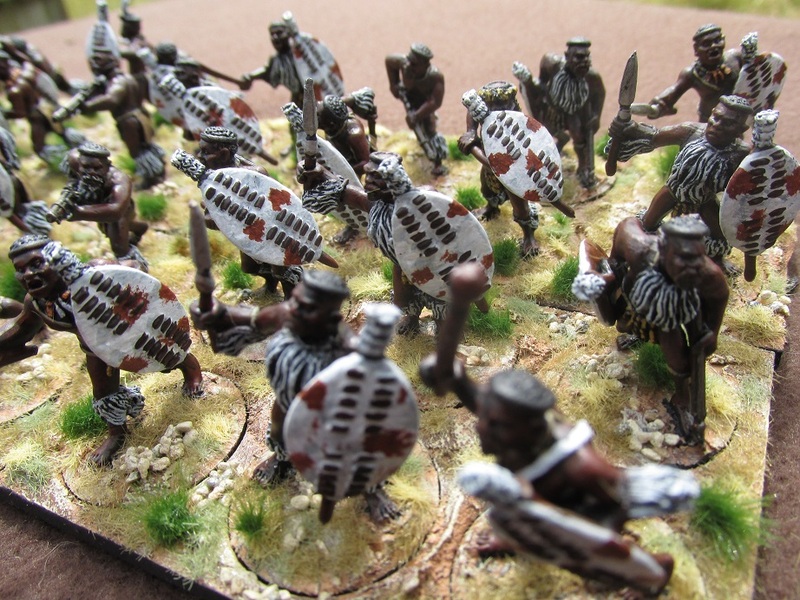 Its warriors were unmarried men 31-32 years of age at the time of the Zulu War. 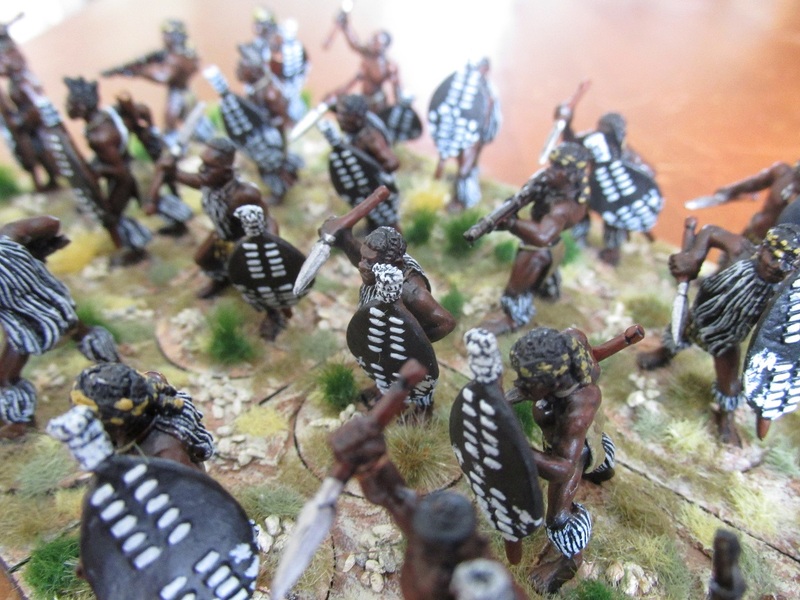 At Isandlwana they formed part of the Chest of the Zulu Formation. 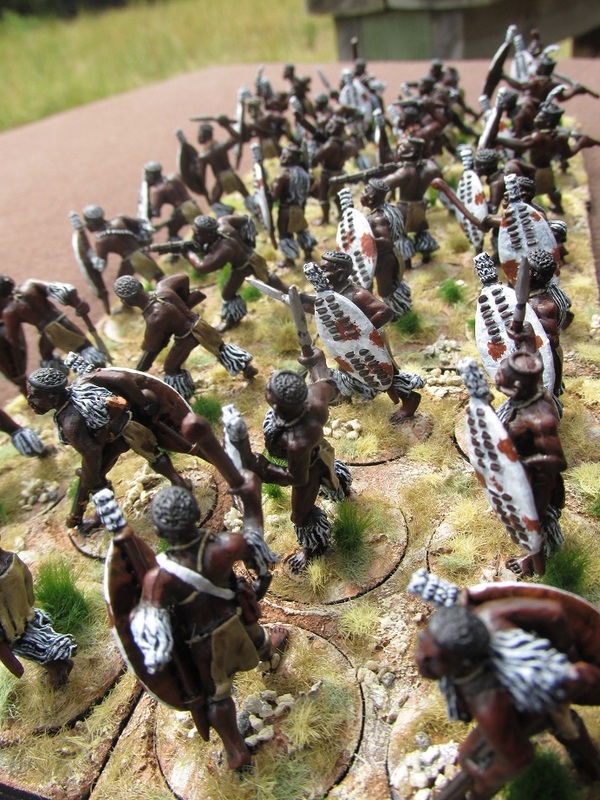 um Cijo were present at Isandlwana (22nd January 1879), Kambala (29th March 1879), Gingindlovo (2nd April 1879) and Ulundi (4th July 1879). 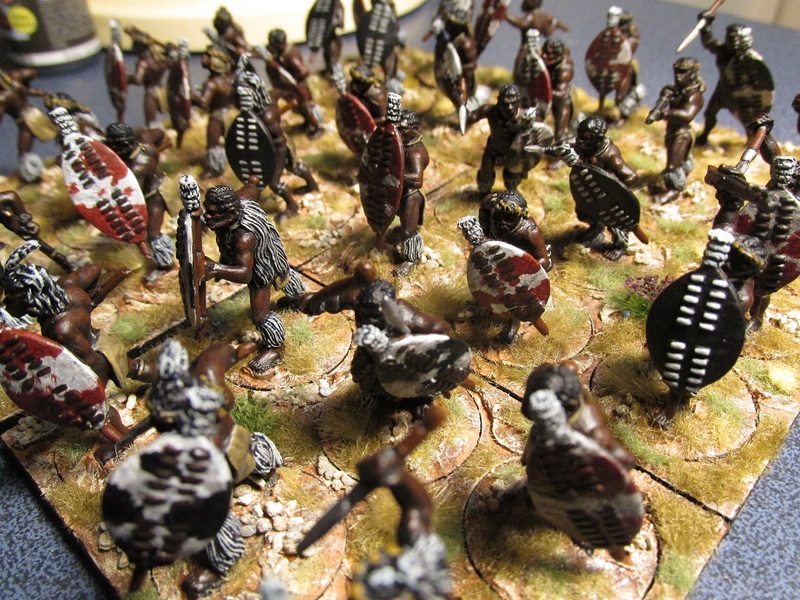 They were probably also at Hlobane (28th March 1879). 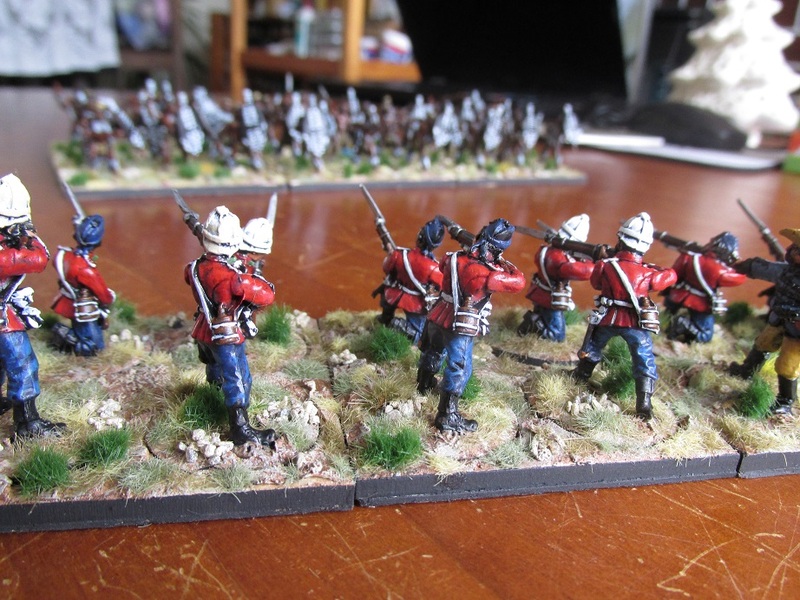 I have another unmarried regiment about half done at the moment and am trying to get them finished so I can start on the next three married regiments I have figures for. 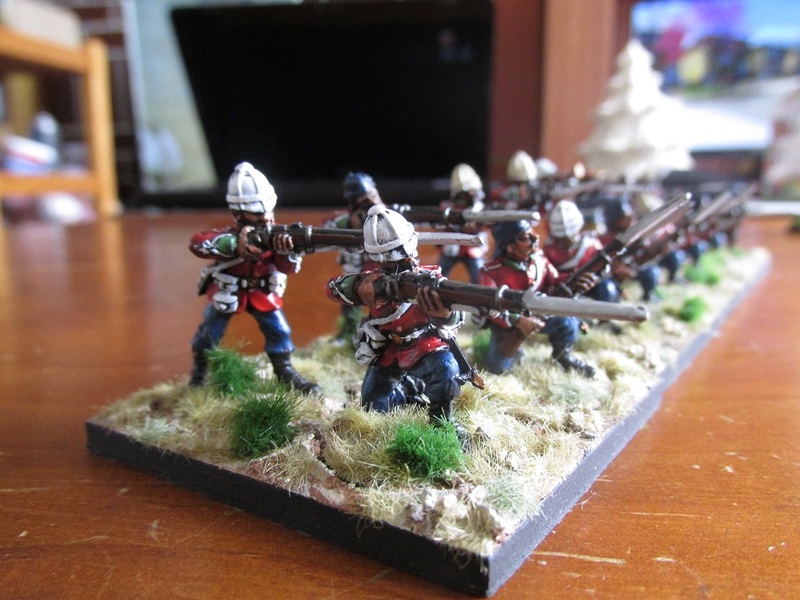 Once again these are Black Tree Miniatures that I got a few months back during one of their excellent sales. 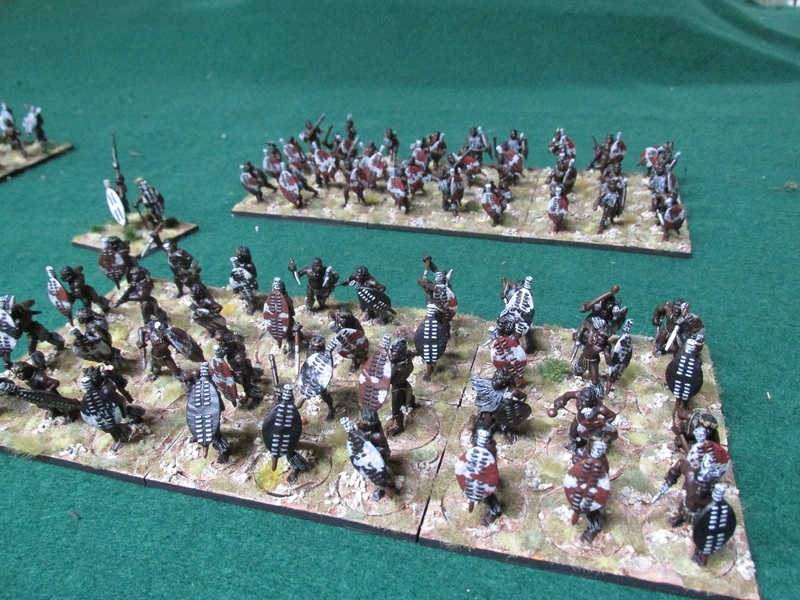 All my Zulu regiments so far have been 36 figure units. 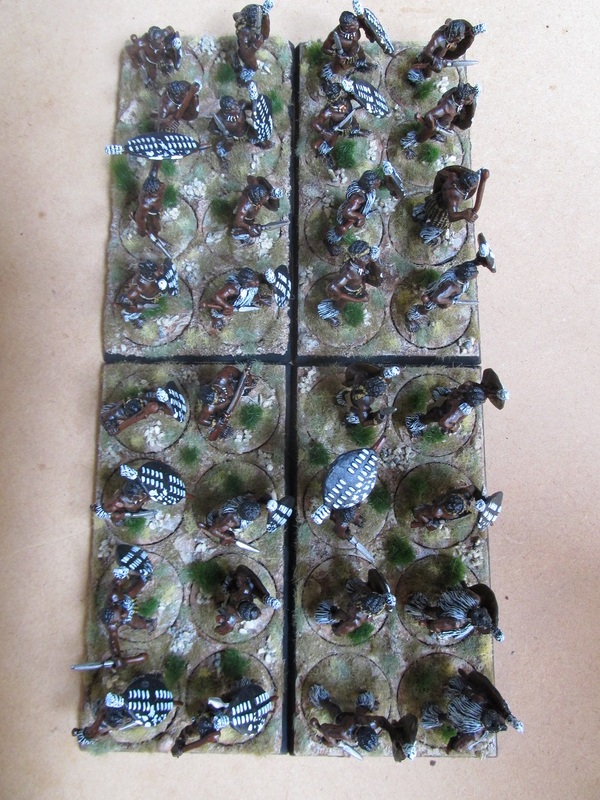 I had acquired these 8-slot resin bases some time ago and figured I might as well use them. 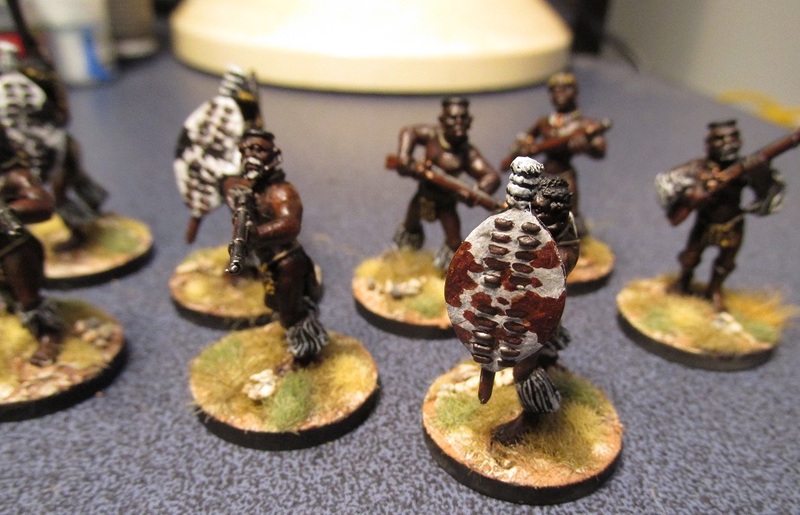 My last twelve Zulu figures completed. 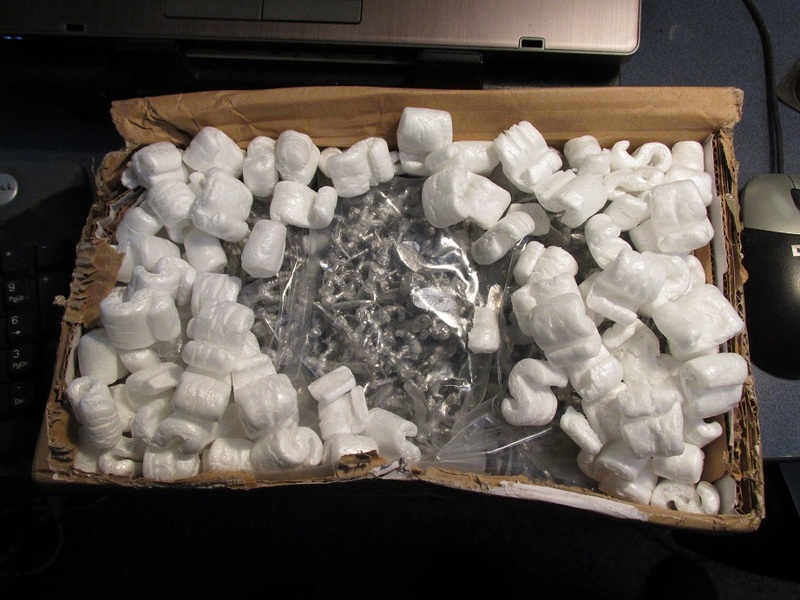 Now completed all the metal Black Tree Designs figures I acquired three months back. 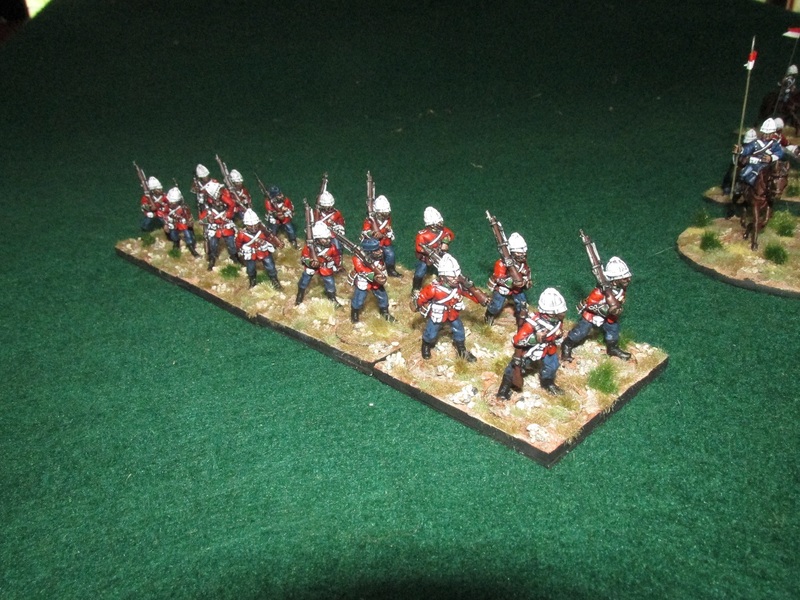 I have some plastic Warlord British and Natal Native Infantry that I have decided to crack on with. 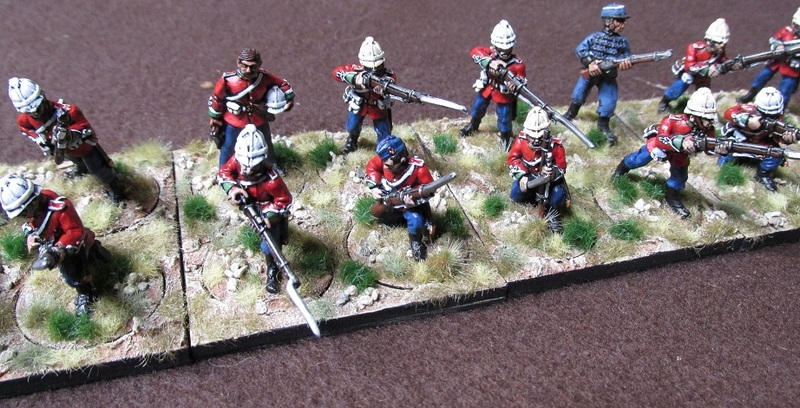 These skirmishers are armed with old flintlock muskets and a few carry Martini Henry rifles that they have acquired from fallen British soldiers. 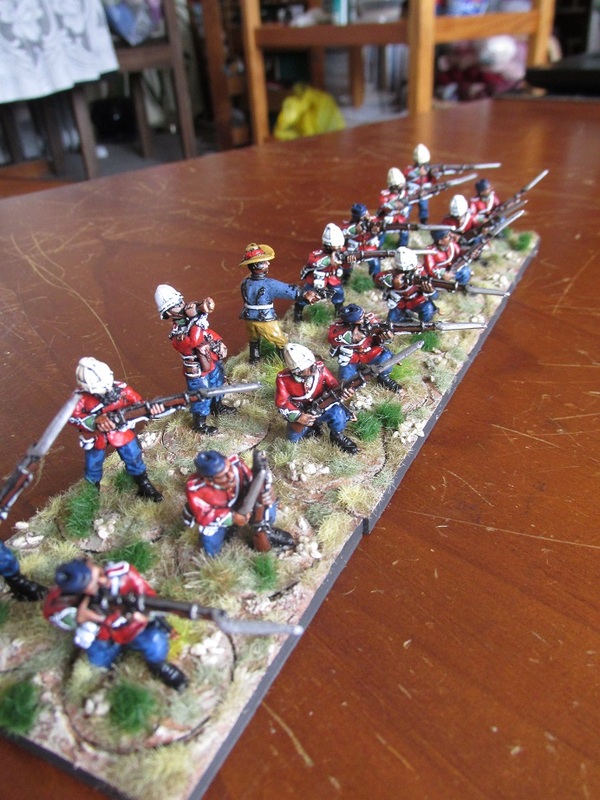 My third regiment rolls off the production line. 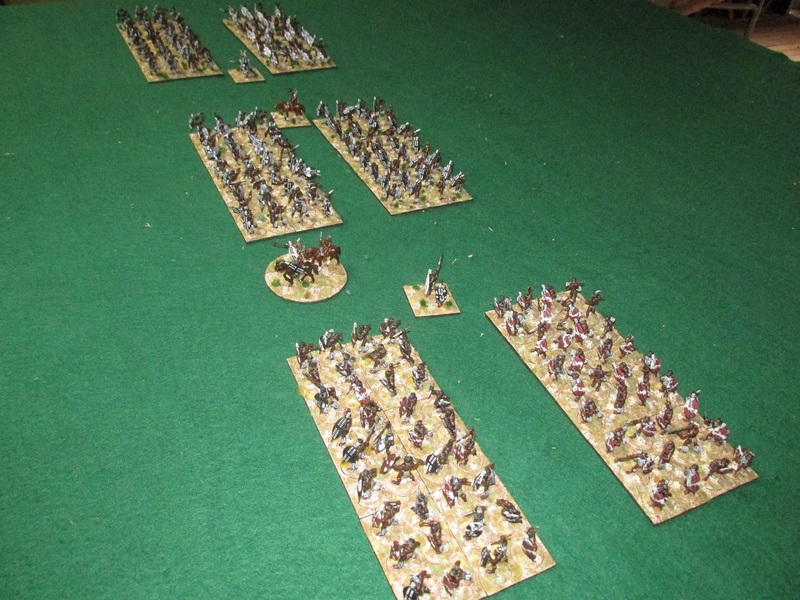 Another four day effort for a thirty-six figure unit. 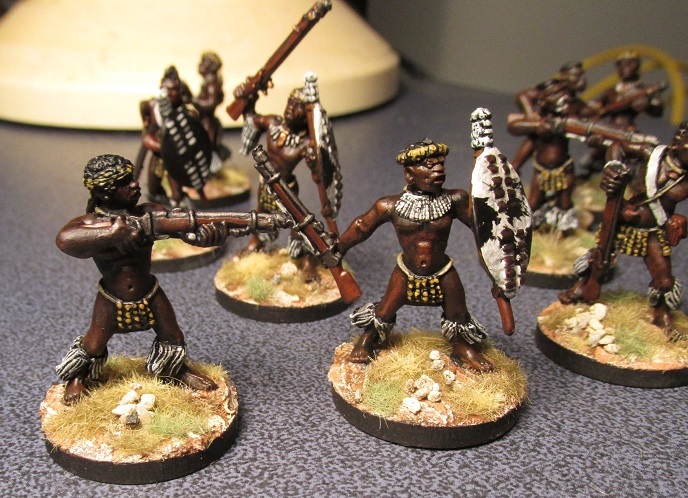 I am really enjoying painting these miniatures. 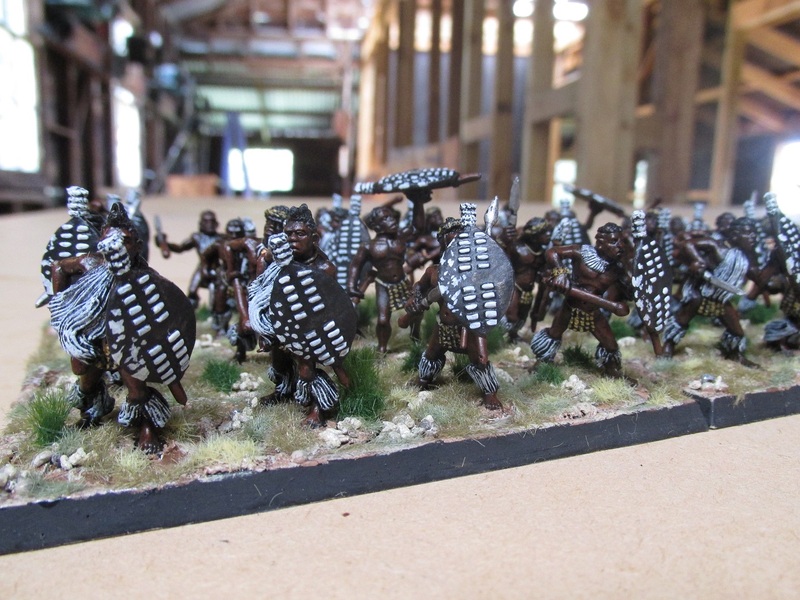 This unit is the InGobamakhosi (“The Bender of Kings”) regiment. 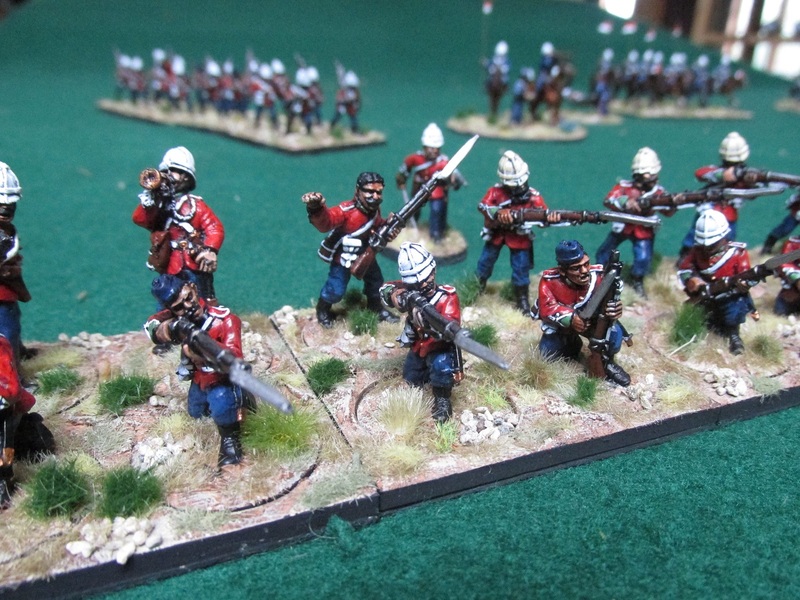 This regiment was an unmarried regiment that was formed in 1872/73. It was present at Islandlwana and several other major engagements of the war. 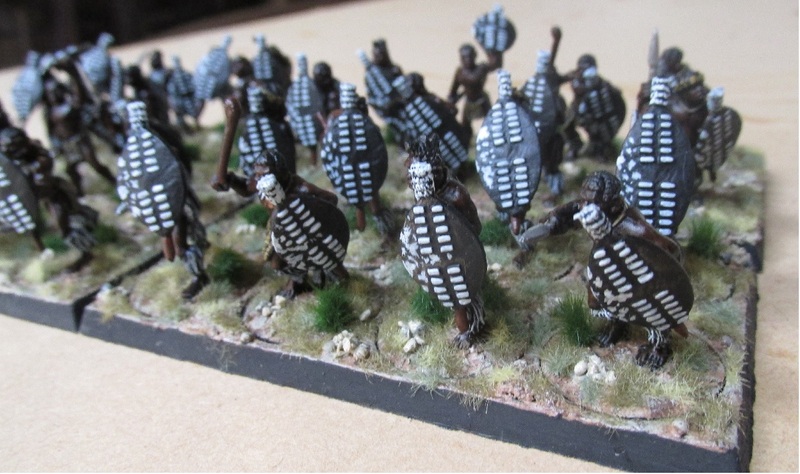 The unit carried mixed shields, which was great because painting over thirty Zulu shields at a time can be quite tedious.